We’d love your help. 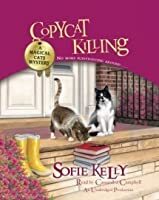 Let us know what’s wrong with this preview of Copycat Killing by Sofie Kelly. To ask other readers questions about Copycat Killing, please sign up. Yes, it kept the annoying stuff. Yes, Kathleen goes a bit crazy with poking her nose in police business. Yes, she still wants to teach Marcus how to do his job. And everyone is nice! But, in the case of this book, I do not care at all. Copycat Killing has more than one mystery to be solved. Most of it has roots in something that happened a very long time ago. I'm being vague because I don't want to spoil anything. The past and the truth can't stay hidden as the inhabitants of this sma I loved it. 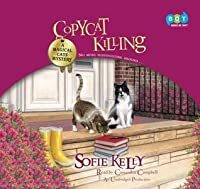 Copycat Killing has more than one mystery to be solved. Most of it has roots in something that happened a very long time ago. I'm being vague because I don't want to spoil anything. The past and the truth can't stay hidden as the inhabitants of this small town would realise. The cats play only a small part, but not as in previous two books. The chemistry between Marcus and Kathleen is off the charts and the way author didn't use it on every page they appear together only makes it better. I loved that. Overall, I really enjoyed it. It's raining in Mayville Heights, the resulting mudslides uncover a body, who could be the pater of one of the sleuth's good friends. Then an artist who makes avant garde masks is killed. Kathleen investigates, the super cop spins his wheels, and things turn out the way they should. WEll contsructed mystery. Still continuing to enjoy the heck out of this series. The magical cats are just fun, I love Kathleen's two main female friends, Maggie and Rona, and I'm enjoying the slow burn that is the romance. Plus just in general the secondary characters are great. I love the town. The one problem with setting a mystery series in a small town though, is the fact that already a fair number of the tertiary characters (recurring, but not significant), have been either suspected or convicted of murder (or both Still continuing to enjoy the heck out of this series. The magical cats are just fun, I love Kathleen's two main female friends, Maggie and Rona, and I'm enjoying the slow burn that is the romance. Plus just in general the secondary characters are great. I love the town. As with the previous books, I enjoyed this light-hearted mystery. I like the characters, it feels like they could be people I'd call friends in real life. Even better, the mysteries are fun and not too creepy/gruesome. I wish that, three books in, there were more development on the cats' magical abilities. It's been long-hinted that their abilities might stem from the house where they were found, but Kelly hasn't expanded upon that. In this third book, she created an opening for this to be developed in the next book, but it feels like ti should have been addressed by now. Narrator Cassandra Campbell did another great job reading this book. It's always easy to tell who's talking and the feeling of the various conversations. She puts emphasis when characters use exclamations or ask questions, and she's really easy to listen to. A fun addition to the series, loving the Hercules/Owen page-time as usual and I'm excited to see the Kathleen/Marcus romance progress. 1. How many times did we need to have yet another Mayville resident ask Kathleen how her head felt/tell her that her forehead wound looked painful? It felt unnecessarily repetitive. Too real-life, not enough narrative discretion. 2. How many Mayville denizens will be left standin A fun addition to the series, loving the Hercules/Owen page-time as usual and I'm excited to see the Kathleen/Marcus romance progress. 2. How many Mayville denizens will be left standing by the time Kathleen has been there, say, five years? I mean, she's only been in town for one year and already she's blown the lid off more murders than I suspect your average small Midwestern watering hole sees in a decade. I mean, c'mon, (view spoiler)[ the MAYOR killed someone (hide spoiler)]?! And is no one suffering any devastating psychological side effects from all these murders of local fixtures? Ruby sure did bounce back after the trauma of (view spoiler)[ her boyfriend murdering her mentor (hide spoiler)] in book 2. If Kathleen can stop bringing up the fact Marcus doesn't have a library card that would be great. It isn't funny, it just makes her sound like a snob. Also, she should stop whining about him doing his job. Some people might think her protectiveness toward her friends is endearing, but to me it makes her stubbornness obvious. I just want her to treat Marcus better. In particular I enjoyed the two-part mystery that was going on as well as all the little mysteries that were included. I also really liked that Kathleen attempted to use her head in this mystery and did not go blundering into situations willy-nilly. She took the time to think about the best way to approach a situation at the end of the book and made the right choice. Characters in cozies so often make the wrong choice that I was thrilled when I realized how smart she played the situation with Peter. - This is a small thing and probably only annoyed me but every time Kathleen went to the co-op the author mentions that so and so is waiting at the door for her, or by the door etc. After a while I wondered if Kathleen was always running late because people were always waiting on her. More likely the co-op is locked and you have to be a member to get in, so if she is coming over, her friends have to be there to meet her, but after the first couple times it's kind of a given isn't it? It was repetitive and on top of my previous point, it annoyed me a bit. - There were some small typos throughout the book that caught my eye. I hope that the next book is edited a bit more thoroughly because when I am reading nothing will throw me off more than a typo. Edited to add a couple small annoyances with the cats. I understand that as Hercules and Owen are magical cats they can eat anything, at least that is the premise that Kathleen repeatedly presents, however about halfway through the book I decided that her cats must be 800 pounds each because they eat constantly. My cat meows all the time for food too, but I don't cave every single time! Also, if she is not going to heed Roma's sound advice and not feed them people food, at least she doesn't have to repeat that all the time. Also, Kathleen talks to the cats and that is fine but she also 'thinks' how weird people would think she was for talking to cats a lot. It's fine that she feels self-conscious and it's fine that she talks to them but it is bit annoying to read the same thoughts about feeding them too much, feeding them too much people food, or how weird people will think she is for talking to them over and over. I think all of this can be solved with some fast editing though. Additionally I love the fact that so many people in this town are artistic in some way, it makes the town feel really fresh and exciting as I never know what hidden sides to their personality people may have - it is much different than some other cozies I have read where the characters are very one-dimensional or superficial. Welcome back to Mayville Heights! I hope you brought your umbrella, boots and a rain slicker. It's been "raining cats and dogs" for days. There is flooding all over town. The local artists' co-op has a basement full of water and our favorite librarian Kathleen is helping her friends move their work to higher ground in case the water continues to rise. All the artwork is saved but one artist isn't as lucky. Mask maker Jaeger Merrill is found drowned in the basement. The death doesn't look accident Welcome back to Mayville Heights! I hope you brought your umbrella, boots and a rain slicker. It's been "raining cats and dogs" for days. There is flooding all over town. The local artists' co-op has a basement full of water and our favorite librarian Kathleen is helping her friends move their work to higher ground in case the water continues to rise. All the artwork is saved but one artist isn't as lucky. Mask maker Jaeger Merrill is found drowned in the basement. The death doesn't look accidental to Kathleen. Detective Marcus Gordon is on the case and Kathleen along with her fantastic felines just can't help themselves from assisting him in any way they can. Owen and Hercules use their magic to help "unmask" the killer. I especially enjoyed this story because of the history featured that creates a mystery inside of a mystery. The town is getting ready to celebrate the library’s centennial with a very special showcase of the groups that have met at the library over the years. One group was doing more than most people knew and some journals from Rebecca's mother are discovered that hold several secrets. But I am still enjoying the series. I can't decide if I like the pace of the relationship or not. I think it'll depend on how it goes from here. What a great mystery! Even though I had already figured out who killed Roma's birth father, I couldn't discern who had killed Jaeger! That's right! Two murders for the price of one! Kathleen is such a warm and genuine person; I am very happy for her that she has finally found someone who can challenge her, irritate her, and be totally charming at the same time! Marcus Gordon and she are purrrrfect together! I am also so glad that Hercules and Owen were featured more and that their detective abilit What a great mystery! Even though I had already figured out who killed Roma's birth father, I couldn't discern who had killed Jaeger! That's right! Two murders for the price of one! I am also so glad that Hercules and Owen were featured more and that their detective abilities were better utilized! I can't believe I just wrote that about two kitty cats but they are both of the paranormal type of cat! When is a librarian more than a cataloger of books and periodicals? When that librarian is Kathleen Paulson, interim head librarian of Mayville Heights, Mn. Since moving to Mayville to assist in the restoration of the their beloved Carnegie library, she adopted 2, seemingly magical cats, a number of great friends and found 3 dead bodies. It's been raining cats and dogs (pun intended) in Mayville Heights. Now the local artists' co-op is on the verge of flooding. Kathleen has been up all night help When is a librarian more than a cataloger of books and periodicals? When that librarian is Kathleen Paulson, interim head librarian of Mayville Heights, Mn. Since moving to Mayville to assist in the restoration of the their beloved Carnegie library, she adopted 2, seemingly magical cats, a number of great friends and found 3 dead bodies. It's been raining cats and dogs (pun intended) in Mayville Heights. Now the local artists' co-op is on the verge of flooding. Kathleen has been up all night helping her friends move their creations to the safety of the upstairs studio. When, controversial mask maker, Jaeger Merrill is found drowned in the co-op basement, Kathleen questions whether the death was an accident. With the help of detective Marcus Gordon—and her cats' extraordinary powers of detection—it's up to Kathleen to unmask a killer. The cats really are adorable (and magical) in this series. I like the setting and Kathleen's group of friends and neighbors. The romance is making some progress but I always expect that to be the case over a number of books in a cozy series. This review has been hidden because it contains spoilers. To view it, click here. 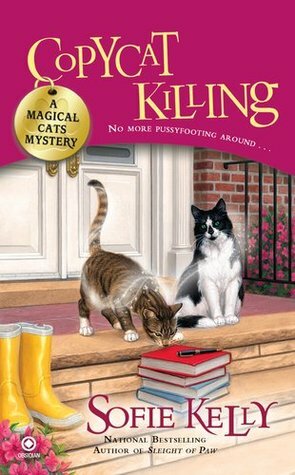 Two cats solves a murder. Cute story. Mayville Heights is having major rain storms causing a huge flood in the small town’s local artists’ co-op. Librarian Kathleen Paulson is desperately trying to help her friends save their art work from being destroyed by all the water. She’s more than a little stunned when she discovers the body of one of the artists floating in the basement. The questions begin starting with why was he down there in the first place. Kathleen stumbles upon a few clues that make her think the artist’s death is mor Mayville Heights is having major rain storms causing a huge flood in the small town’s local artists’ co-op. Librarian Kathleen Paulson is desperately trying to help her friends save their art work from being destroyed by all the water. She’s more than a little stunned when she discovers the body of one of the artists floating in the basement. The questions begin starting with why was he down there in the first place. Kathleen stumbles upon a few clues that make her think the artist’s death is more than an accidental drowning. She’s devastated when the clues lead to her best friend, but she knows Maggie is innocent of any wrongdoing. Kathleen is determined to clear her friend’s name, as well as discover what really happened to Jaeger Merrill. Kathleen gets quite a bit of help in her search for the truth starting with her two magical cats, Owen and Hercules. Their mystical powers come in handy in cracking this case, along with the help of the handsome detective, Marcus Gordon. This is a fast–paced book with a cozy setting, loveable characters and more twists and turns than a rollercoaster. An excellent cozy! This book is a fun, light read with a quirk. The quirk is the two cats that belong to Kathleen - one can appear and disappear at will and the other can walk through walls, literally. They also understand everything Kathleen says to them and the book is full of very humorous 'conversations'. I got this out of the library because I needed to find a book with my name in the title, author, or key character, and title and author searches didn't find me anything that appealed. Then this came up so I de This book is a fun, light read with a quirk. The quirk is the two cats that belong to Kathleen - one can appear and disappear at will and the other can walk through walls, literally. They also understand everything Kathleen says to them and the book is full of very humorous 'conversations'. This is the third book in the magical cat series.They are two murders one from the past and one in the present. Both Owen and Hercules are as cute and helpful as they have been in the first two books. There's some questions that are answered that were left from the 2nd book. If Kat says "i'm ok" one more time when she gets hurt & it's obvious she's NOT i'm going to stop reading the series all together. Why can she just admit she's hurt & it hurts? Her stupid stubbornness is really getting to my. Rain, rain, and more rain wrecks havoc with the town of Mayville Heights. The rain also brings unexpected mystery. Kathleen, head librarian, falls down a slippery slope while feeding feral cats at an abandoned mansion and uncovers someone (yes you read that correctly). When she helps her friend Maggie move work in the town's art co-op Kathleen finds more than she bargained for in the water in the basement. Are these two incidents related or just bad timing? Kathleen and her close friends Roma and Rain, rain, and more rain wrecks havoc with the town of Mayville Heights. The rain also brings unexpected mystery. Kathleen, head librarian, falls down a slippery slope while feeding feral cats at an abandoned mansion and uncovers someone (yes you read that correctly). When she helps her friend Maggie move work in the town's art co-op Kathleen finds more than she bargained for in the water in the basement. Are these two incidents related or just bad timing? Hercules & Owen continue to delight me, as does Kathleen referring to their "little kitty brain" at times because I do the same to the cat I live with. Maybe because I'm a sucker for protective/helping people, but I may have enjoyed this one the most. I love Rebecca & Everett, learning about the Ladies' Knitting Circle and the history of Mayville Heights. Kathleen actually working with Marcus as they both approach the mystery from their own preferred angles as a nice change than her putti Hercules & Owen continue to delight me, as does Kathleen referring to their "little kitty brain" at times because I do the same to the cat I live with. Reader thoughts: Flooding, a drowning, and two cat sleuths! I love the small-town-ness of these books. I think I read the books more to read about happy, helpful people (and adorable kitties!) than I do for the mysteries. Writer thoughts: Authors do well when they have more than one reason for any plot point. Kelly used the flooding in her book in several ways. 1, it shut down the library to let Kathleen have more time for investigating. 2, it gave a setting for a drowning. 3, it put the town in mild Reader thoughts: Flooding, a drowning, and two cat sleuths! This series is amazing! I love Sofie Kelly's writing style. I feel as though I am right there in Mayville Heights solving crimes with Kathleen and Hercules and Owen. The cats magical powers are subtle and not over the top. If you are a cat lover these are all things cat lovers are familiar with. I also like the delicate touch she took to the romance. Highly recommend. I like the Magical Cats characters, but did not like this entry in the series as much as the first two. I think there are a few of reasons: too many plotlines, too much romance, and not enough Hercules and Owen (the Magical Cats). I'm not ready to abandon the series yet, but my enthusiasm is dimmed a bit. This series is a good gentle low stress read. I really enjoy how the author treats the behavior of the cats. The small town vibe is realistic but who would have time for all the cooking or money on a librarian's salary. Most small town libraries have very limited funding as well. But this is fiction and good fiction. Sofie Kelly is the pseudonym of young adult writer and mixed-media artist, Darlene Ryan. Sofie/Darlene lives on the east coast with her husband and daughter. In her spare time she practices Wu style tai chi and likes to prowl around thrift stores. And she admits to having a small crush on Matt Lauer. She also writes as Sofie Ryan.